Silk Screen imprints on 100% cotton t-shirts or jerseys. Classic Hi, How Are You album artwork with Daniel Johnston printed down the right sleeve. Gildan Ultra Cotton tee shirts. If you didn't get one at the show, you can still get it here. 5.2 oz Ultra Cotton Gildan DARK HEATHER tshirt with the tour logo on the front and a list of cities and dates on the back. Black imprint on white t-shirt "Keep Punching Joe". 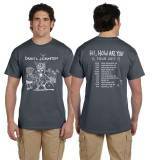 Daniel Johnston signature imprinted on the back. The popular Hi How Are You from from the MURAL WALL on the side of Baja Fresh Restaurant (previously Sound Exchange records) in Austin, Texas. This Austin, Texas landmark was rescued from destruction by local citizens and Baja Fresh owner Johnn Oudt in 2004. Wear it proudly. SHIRTS are SILK SCREENED INK. 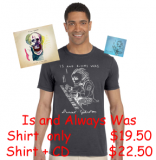 T-Shirt ONLY - $22.50T-Shirt PLUS Album CD - $25.50 - On Sale! \\\"Is and Always Was\\\" produced by Jason Falkner. The T-Shirt is Charcoal 100% Ringspun Cotton. The Image is Silk Screened Ink. Image is SILK SCREEN INK. Black imprint on white t-shirt "The Beast Is Yet To Come." Small CHARCOAL - $19.50 - On Sale!Medium CHARCOAL - $19.50 - On Sale! 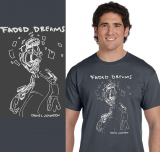 100% preshrunk 4.5 oz SoftStyle cotton CHARCOAL T-shirt with Daniel Johnston's "Faded Dreams" image in an-off white SCREEN PRINT.